Kenya Airways is expanding its influence in the African market by aligning itself with smaller carriers as it seeks to build its home base of Nairobi as a continental hub. This includes promoting greater cross-border cooperation and fostering economic development among nations which jealously guard their independence, despite the clear evidence that this has been a fundamental cause of their problems. Africa’s fourth largest carrier and the continent's only member of the SkyTeam alliance is focusing on airlines in southern Africa, having already brought Air Mozambique, Air Botswana, Air Malawi and TAAG Angola Airlines into the fold. On 20-Dec-2012 Kenya Airways and RwandAir announced plans to form a strategic partnership and build stronger relations including improved synergies in scheduling, reservation systems and a combined FFP. The partnership will also strengthen the airlines' cargo, maintenance and flight training operations. Meanwhile, Ethiopian Airways looks to strengthen its Addis Ababa hub, as the Gulf carriers - now partnering with some global alliance airlines - expand their global networks across Africa. Kenya Airways CEO Dr Titus Naikuni said the partnership was; "in line with our strategy to exploit the untapped economic potential of the African continent”. 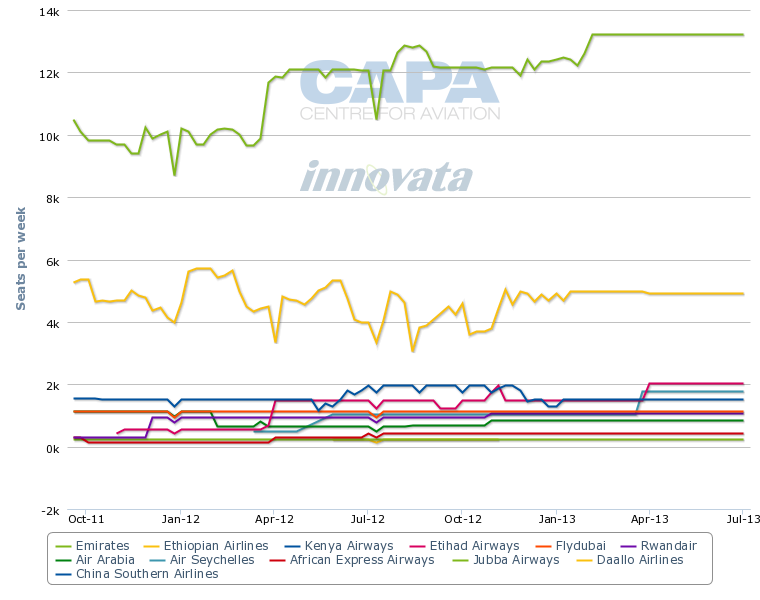 Kenya Airways is one of Africa’s biggest airlines ranked by seats, at 85,486 in the week 14-Jan-2013 to 20-Jan-2013, compared to RwandAir’s 23rd ranking with 17,233 seats. But RwandAir dominates capacity between Nairobi and Kigali, Rwanda, operating three daily services on the city pair, using CRJ900 and Boeing 737-500 aircraft, against Kenya Airways’ twice daily flights operating Embraer E190 and Embraer E170 aircraft. RwandAir also operates to Mombasa from its Kigali base once weekly using a Boeing 737-500. The two carriers offer a relatively compatible schedule. RwandAir’s flights between Kigali and Nairobi depart at 06.00 or 06.15, 16.30 and 20.30 using a mix of Boeing 737-500 and Bombardier CRJ jets. They depart Nairobi at 09.00 or 09.15, 19.30 and 23.30. Kenya Airways flights depart Kigali at 05.25, 15.05 and 16.10 and from Nairobi at 08.35, 15.30 and 23.50. The morning business target flights leave within about 30 minutes of each other as do the late afternoon services from Kigali and the late night services from Nairobi. The combined schedules do also provide a more even spread of flights during the day, encouraging more tourism and investment. However RwandAir flies to just 12 points in Africa from its Kigali hub and adds just three new destinations, Gisenyi and Cyangugu in Rwanda and Mwaza in Tanzania, to the combined network not already served by Kenya Airways directly from Nairobi. In addition RwandAir also operates seven times weekly to Dubai, excluding Thursdays and twice on Saturday, using a Boeing 737-800 aircraft with 154 seats. The finer details of this strategic cooperation including frequent flyer programmes are to be mapped out in various agreements. 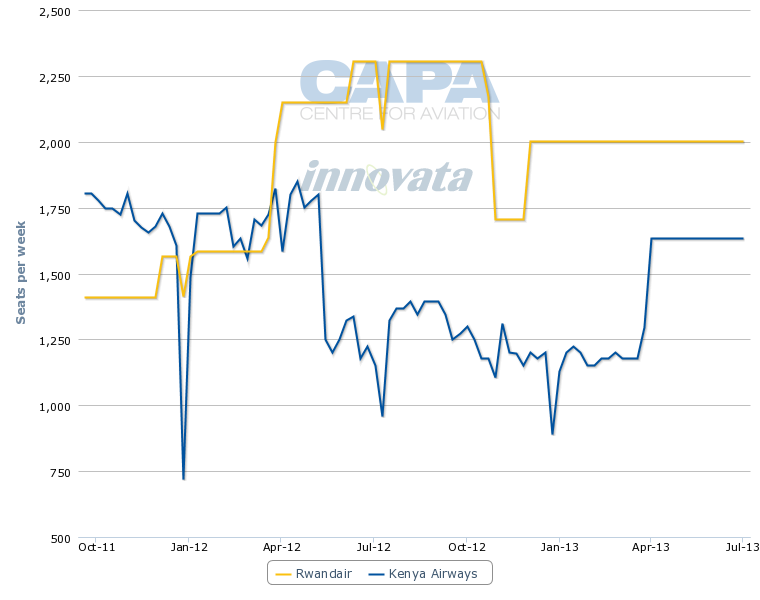 Kenya Airways' strategy is nothing if not ambitious. The airline has set a target of flying to every African capital city by 2014. Air Namibia is another airline in whom Kenya Airways has shown interest. A partnership or codeshare with Air Namibia would benefit trade and tourism between those two countries, as well as providing mutual value to the two airlines. Mr Naikuni held talks with Air Namibia and Namibian government officials in Aug-2012 to discuss possible codesharing as well as operational support that Kenya Airways can bring to bear. Kenya Airways’ membership of SkyTeam has provided other African codeshare partners, including Air Mozambique, Air Botswana, Air Malawi and TAAG Angola Airlines, access to the alliance's global market through Kenya Airways, Mr Naikuni said. At the last AFRAA AGA in Nov-2012 in Johannesburg a number of smaller carriers called for greater support from the continent’s big four, Kenya Airways, Ethiopian Airlines, South African Airways and EgyptAir, to help develop the entire industry. Kenya Airways’ African network currently spans 43 destinations, almost exclusively in the sub-Saharan region, with strong links between its eastern hub in Nairobi and western Africa. In the other direction, its northern Africa access is limited to Cairo. Kenya Airways became a member of SkyTeam in 2010 and is pinning its expansion strategy on building its Nairobi hub as an African gateway for traffic to and from Asia, particularly China as well as India. Nairobi’s Jomo Kenyatta International Airport is geographically well positioned in central eastern Africa to distribute traffic around the continent as well as onward to Europe. Kenya Airways’ aggressive 10-year growth plan is based on taking advantage of the surge in east to west traffic, driven by new investment and the rapidly growing middle classes in Asian economies. The 10-year strategic plan called Project Mawingu, named after the Swahili word for cloud, would by 2021 see Kenya Airways launching seven new routes into China, six into the Indian Subcontinent and three across North and Southeast Asia as well as increasing its presence in Europe and the Middle East. Mr Naikuni said in Sep-2012 that as the only African member in the SkyTeam alliance, combined with the airline’s expansion strategy, Kenya Airways was “well poised to take advantage of this unique positioning to take traffic from markets such as China into the rest of Africa and Europe”. The airline has ordered three Boeing 777-300ER, expected from Oct-2013, and nine Boeing 787-8 aircraft to be delivered from 2014, replacing Boeing 767 aircraft and expanding Kenya Airways’ network, partly financed using proceeds from a rights issue in June which raised EUR187 million. Kenya Airways’ fleet of 12 Embraer regional jets will also be expanded, with eight more expected to be delivered by the end of FY2013. As aircraft orders begin to be delivered Kenya Airways plans to open three new points outside of Africa every year in addition to expansion of its intra-African network. Kenya Airways plans to expand its network into China from the current two, Guangzhou and Hong Kong, to six destinations by 2021 including Beijing, Shanghai, Chengdu, Chongqing, Xiamen, Kunming and Urumqi. Kenya Airways operates daily Nairobi to Bangkok using Boeing 777-200 aircraft, going on to Guangzhou four times a week and Hong Kong three times weekly. Kenya Airways will rely heavily on its Chinese SkyTeam partners, China Airlines, China Eastern, China Southern and Xiamen for codeshare agreements between China and Africa and provide traffic feed in China. 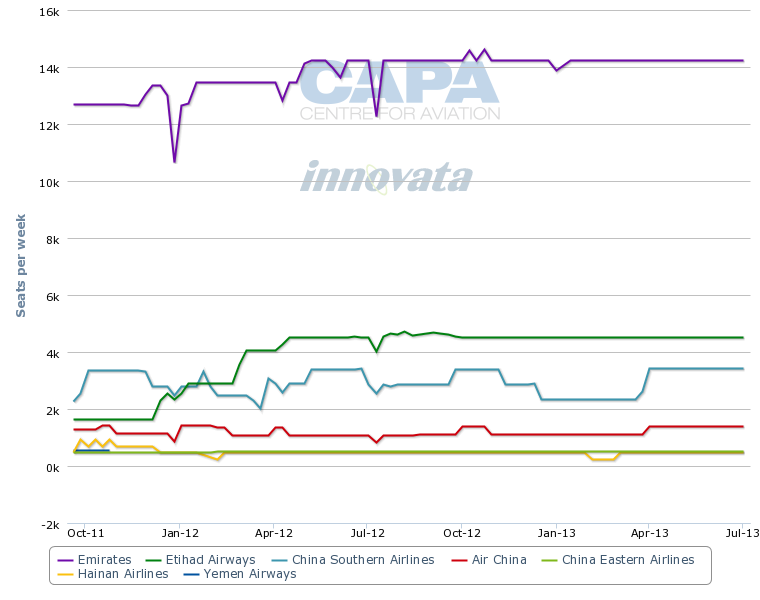 The airline already codeshares with China Southern on the Dubai-Guangzhou route. On 08-Nov-2012 Kenya Airways expanded its footprint in Southeast Asia by signing a reciprocal codeshare agreement with fellow SkyTeam member Vietnam Airlines. The agreement covers daily services between Nairobi and Bangkok and on to Hanoi and Ho Chi Minh City in Vietnam. Kenya Airways also has its sights set on the Indian Subcontinent with plans to add another two destinations to existing Mumbai and Delhi services. Dutch national carrier KLM and SkyTeam heavyweight, has held a 26% cornerstone stake in Kenya Airways since 1995, making it the airline’s next largest shareholder after the Kenyan Government with 29%. KLM invested EUR48 million (USD64.26) as part of a USD250 million rights issue by Kenya Airways to maintain its shareholding level. And both KLM and Air France are important parts of Kenya Airways' strategy, having grown the number of destinations to Kenya available from Amsterdam Schiphol and Paris Charles de Gaulle airports, with KLM expanding its African destinations to 15 and the carrier, combined with Kenya Airways, offering 43 weekly services between East Africa and Europe. 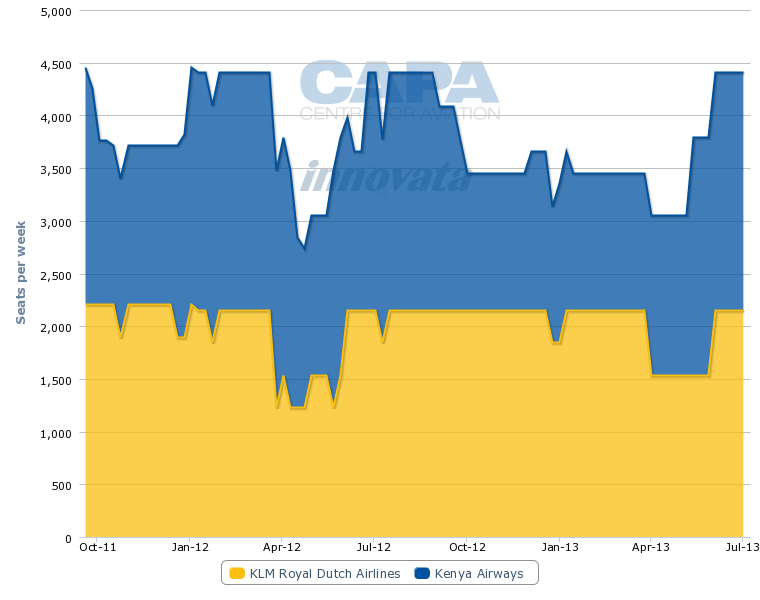 KLM MD Erik Varwijk said in Jul-2012 that: “KLM sees great growth opportunities in Africa. This year we launched service to Luanda in Angola and Lusaka in Zambia”. KLM provides more than half the total seats between Nairobi and Amsterdam over the course of the year. Kenya Airways and its northern competitor, Star Alliance's Ethiopian Airways, are challenging to establish a dominant African hub. 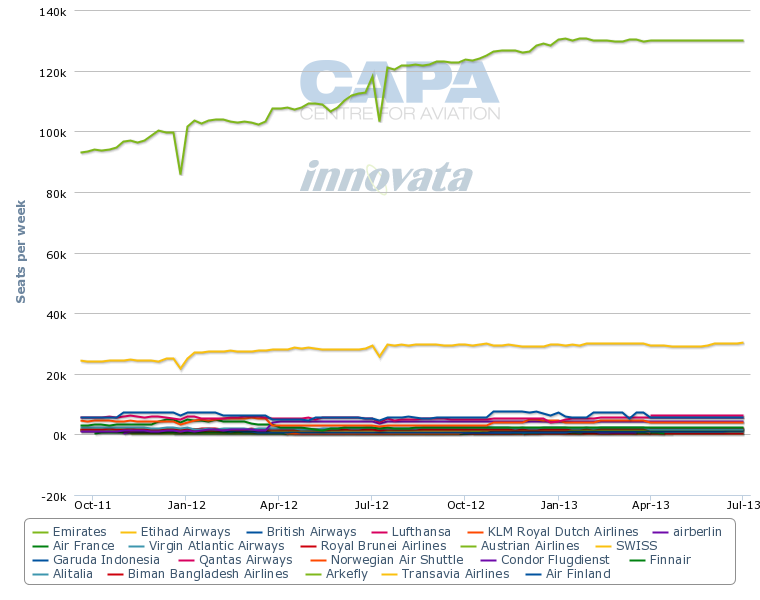 Both airlines are among the few consistently profitable African carriers. For the time being Kenya Airways is somewhat more modest in its longhaul coverage. One advantage which Ethiopian Airways is able to exploit effectively is that it has the protection of the Ethiopian government - which keeps a tight rein on foreign airline access to Addis Ababa. From a hub perspective this does however in turn tie expansion prospects to those of Ethiopian Airways, as well as limiting the variety of connecting traffic onto Ethiopian's services. Nairobi is still dominated by Kenya Airways, but has a healthier mix of international airlines calling, including KLM and British Airways. But, despite their local rivalries, Kenya Airways and Ethiopian Airways have a mountain to climb to overcome the massive advantage of the Gulf carriers. Dominated by Emirates and its strong Asian links, Etihad and Qatar Airways too are able to funnel traffic between east, west and south into Africa over their United Arab Emirates hubs, all the time strengthening their network power. Middle Eastern airlines have more than doubled their capacity into Africa in the past 10 years. By way of contrast, European carriers - historically the long-haul gateway providers - have added just 18% over that time. Emirates offers 14,240 seats between Dubai and China, more than three times that of compatriot Etihad. Chinese mainland carriers China Southern, China Eastern and Hainan collectively provide 3,305 seats. 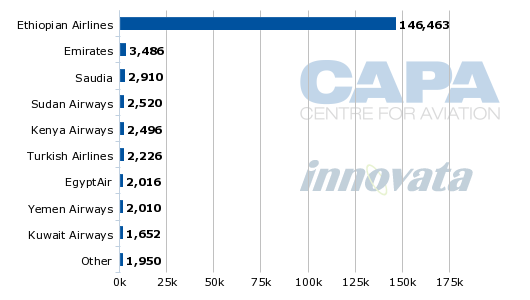 Emirates has also substantially grown its capacity between the Gulf and Western Europe to 129,921 seats in the week from 14-Jan-2013 to 20-Jan-2013, compared to just 29,026 seats from Etihad. 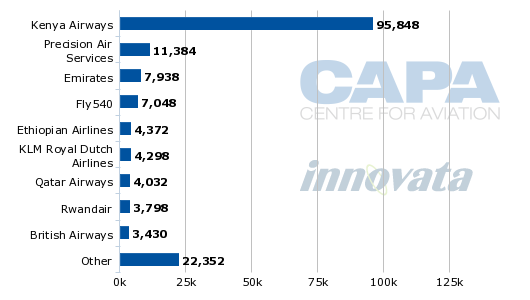 And Emirates accounts for 12,210 seats between the Gulf and East Africa, where Ethiopian Airways is the nearest competitor with 4,977 seats and Kenya Airways’ 1,512 a distant third. Both Kenya Airways and Ethiopian Airways have significant growth plans over the next 10 years, fuelled by Africa’s burgeoning economic power. Kenya Airways intends to triple the size of its fleet to 107 aircraft, allowing it to add 60 destinations to 32 countries, while competition with Ethiopian Airways will shift the focus away from South Africa, the continent's biggest economy and ailing heavyweight South African Airways, to East Africa. In each case the airlines will rely on their respective global alliance partners to wrestle back at least some of the initiative from the dominant Gulf carriers. Yet, at the same time, as the Gulf airlines insert themselves effectively into the alliance structure - with Qatar to join oneworld, Etihad working with Air France-KLM, Emirates partnering with oneworld member Qantas (with more to come) - the world is changing quickly. It is almost inevitable that these other relationships will overflow into the African scene in the not too distant future.